The Sant’Anna School is a public university institute working in the field of the social and applied sciences. Sant’Anna aims at experimenting innovative paths in research and education in an international environment. Professors and researchers interact with the students to develop innovative ideas in collaboration with foreign universities, companies and research institutes, enjoying a continuous cultural and intellectual exchange. Scientific excellence, innovation and internationalization have allowed the School to be in a prestigious position on an international level. According to “Times Higher Education”, the School is the leading institution for academic performance in Italy, ranking 9th among young universities and 3rd among small universities. The School is organized in six Institutes that manage research and education for the Ph.D. courses, I level master courses and II level masters courses. The Institute of Management focuses its activities on the management of innovation, sustainability and healthcare. The Master MAINS is a full-time second-level University Master that was set up more than 25 years ago. It is the first Master course in Innovation Management in Italy, and it has trained high-potential leaders in collaboration with outstanding partner companies since 1991. 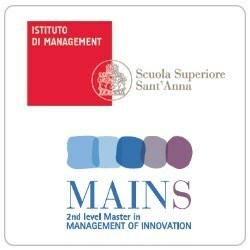 MAINS is a one-year multidisciplinary Master course, focusing on the management of innovation, entrepreneurship and digital technologies. It is entirely taught in English and open to international candidates. Closely designed with the University of Trento, the main feature of the Master is the strong relationship with partner firms, which are involved in all the learning activities. This makes the program one of the best gateways towards first-class careers in the area of innovation management in companies operating in the industrial, financial and service sectors. Students enrolled in the MAINS live a challenging intellectual and interdisciplinary experience in our campus, interacting with leading scholars and first-class partner firms, and enjoying the academic and business opportunities of the Sant’Anna School. The Master provides a first-class curriculum covering the diverse areas linked to innovation, from strategy and business model innovation to Big Data, R&D management, management of "industry 4.0” technologies, Project and Risk management, Knowledge and Change management, and many other topics. The Master comprises activities for a total of 79 ECTS. Innovation LABs are one of the most important features of the Master. These activities are part of the second quarter of the class schedule and they allow the students to work on specific topics suggested by the participating firms. The aim is to approach a business problem with an innovative perspective with teachers and managers working shoulder to shoulder with the students. This is a unique opportunity to work on teams alongside innovation leaders to tackle real life problems identified by partner firms. Primary Italian and international firms are investing in new talents, supporting proactively the Master MAINS. The firms contribute by providing numerous scholarships and opening internship opportunities for the students. Moreover, the partner firms are actively involved in the Scientific Committee that decides the updates of the program, and they also present their experiences and perspectives to the class. THE MEMBERS OF THE STEERING COMMITEE: Airnivol, Amadeus, Arval, Cabel, Engineering, IBM, Illogic, Intesa Sanpaolo, Piaggio Group, Telespazio and Tim (please check the updated list on the master’s website). OTHER PARTNERS: Air Italy Spa, Ansaldo Energia, Capgemini, Enel Italia Spa, Fondazione Global Compact Network Italia, HSE24 Knauf, Lagardère, Lenovys, Leonardo Global Solutions, Leroy Merlin, Selex-Es, SIA, Spindox, Thales Alenia Space, Unicoop Tirreno, Vision and Value. Recruiting events are scheduled in spring, where partner companies meet the students to present many internship opportunities. A compulsory four-month internship is scheduled starting from September. During their internship, the students have the chance to shift the skills and education received in the classroom to a practical experience. This opportunity completes the educational path and provides a unique opportunity to start working on innovative activities of leading firms. The placement rate is very high: about 90% of the students find a qualified job within three months from graduating date. Additionally, many students are job-hunted even before graduating. The full participation fee is € 8.000, but a number of scholarships is available each year. These scholarships are assigned according to the merit rankings and/or the requirements established each year by the sponsors. The winner of the scholarships will be notified at the publication of the rankings. The National Social Security Institute (INPS) also provides nine scholarships to cover the enrolment fee (in full). Only those who are under 31 (-years-old) on December 31st 2018 can apply for the Master. The Alumni Association of the Master-AMMISA, founded in 1995, aims at strengthening the personal and professional links among the participants in the past editions. Additionally, the association organises regular meetings for the associates with the aim to discuss on innovation related issues with keynote speakers from academia and top corporations. The AMMISA associates are part of an international network that allows a cross-country flow of information and opportunities.